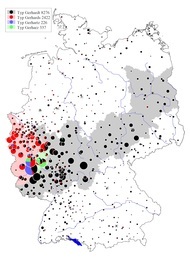 The now available sixth volume of the German Surname Atlas (DFA) contains forty-nine sets of maps with a total of 253 detailed maps showing the distribution of surnames derived from given names. The eponymous ancestor was named after the given name of his father or another person of reference. "This volume provides the first systematic and comprehensive survey of the geographic correlations between the stock of forenames used in the Middle Ages and that of surnames in one country," explained Dr. Kathrin Dräger, author of the volume and member of the DFA project team. Surnames preserve the stock of historical forenames and are the only possible source from which to reconstruct how forenames were used in the spoken language—"Wörz" instead of "Werner" or "Jauss" instead of "Jodocus", for example—in comparison with more or less official documents. "The newly published volume is more than a primary source for surname and forename research as it also provides insights into cultural history, in particular the development of the spoken language, the medieval veneration of saints, and the appropriation of dynastic names," said Dräger. Volume 6 is the last of the main German Surname Atlas reference works to appear. The first three volumes focus on grammatical phenomena: the varying distribution of vowels (Meier, Meyer, Maier, Mayer), consonants (Schmidt, Schmitt, Schmid, Schmitz), and mode of formation (Linde, Linder, Lindemann). The three subsequent volumes deal with the meaning of surnames and why they were given to particular people. Volume 4 looks at surnames traceable to place of origin or residence, while Volume 5 examines the surnames derived from professions and personal characteristics. Later this year, Volume 7 containing the index and the bibliography is to be published. The German Surname Atlas was a joint project undertaken under the supervision of Professor Konrad Kunze of the University of Freiburg and Professor Damaris Nübling of Johannes Gutenberg University Mainz. The German Research Foundation (DFG) provided funding for the project from 2005 to 2015.